There is nothing quite like finding the first bone or brick of ancient remains. While such discoveries can take mere moments, understanding the whole story behind ruins, lost kingdoms, and old familiars can take decades. Archaeological sites can grind to a standstill, only moving forward again with the “story” when the next find falls into place like a lost puzzle piece. These additional discoveries can change long-held beliefs, open new mysteries, and even change the entire purpose of an ancient site. Miguel de Palomares was one of the first Catholic Priests to arrive in Mexico after the Spanish conquest in 1521. His grave was discovered by accident when, in 2016, workers dug a pit for a lamp post. When archaeologists widened the space, they discovered a large slab with the name de Palomares carved on it. 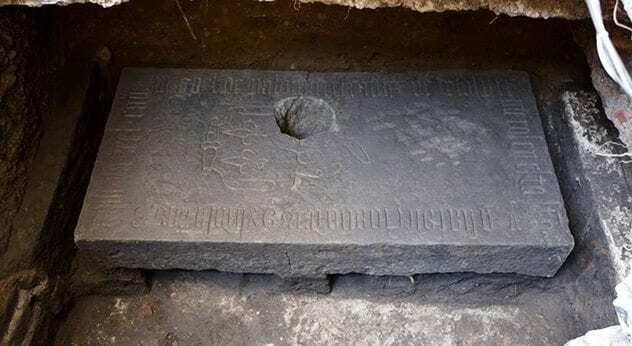 The two-meter-long gravestone marks an unusual burial place for a Catholic priest—beneath the floor of an Aztec temple. For a long time, scholars were aware that the Spaniards erected churches over native religious sites. The behavior was labeled as a dominant display of whose god was better, in effect, a symbolic replacement of the local deities by Christianity. Now, it would appear that the Spaniards were a little more practical-minded. The Aztec temples had solid foundations and sturdy walls, all ready to be used. To save time, de Palomares’s particular temple’s floor was simply whitewashed and otherwise left untouched when it was turned into Mexico City’s first cathedral in 1524. A slice of the Victorian palate was revealed during construction work in London. In 2010, a demolition team took apart an old nightclub to make way for the Crossrail station. The club hailed from the 1970s but had been built over an even older site. 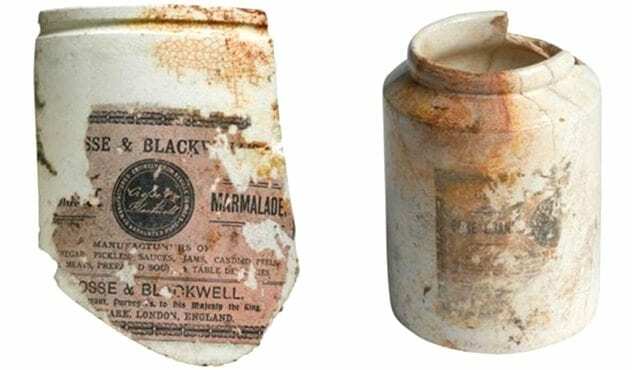 Crosse & Blackwell had a factory there from 1830 to 1921, and archaeologists got a peek at the products that appealed to the Victorians. Beneath the former nightclub, they found over 13,000 jars. Pots of Mushroom Catsup, jam, marmalade, and Piccalilli made up the discarded stash of flavors. The cistern in which they were found powered the factory’s steam engines up until the 1870s when it became a dump during an overhaul of the warehouse. The massive haul is valuable due to its size, rarity, and ability to reveal the tastes of the time. After shutting down, the factory became a cinema in 1927 before opening as a nightclub in 1976. At the entrance to Police Scotland Central Division’s Randolphfield HQ, based in Sterling, stands a pair of standing stones. For a long time, these were admired as 3,000-year-old monuments with a mysterious connection to a nearby ancient graveyard. It turns out, the pair could be honoring a much more recent event. 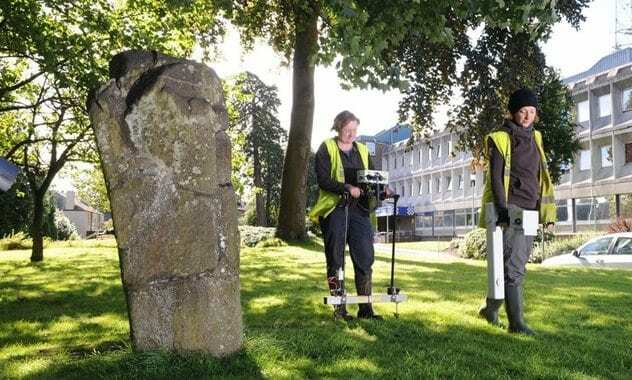 Radiocarbon testing placed the stone sentinels closer to 1314. Something of note did occur in the area during that year. The English and Scottish clashed in the Battle of Bannockburn. On the first day, under the lead of Sir Thomas Randolph (also the Earl of Moray), the Scots cleverly managed to redirect the route of the larger English army. This protected Sterling Castle from an intended attack and also helped the Scottish side to defeat their enemy in a historic encounter the next day. Much like a commemoration plaque today, it is believed that the standing stones were placed on the battlefield to mark Randolph’s success when he managed to throw the English off course. In 2017, experts at the Matsue History Museum decided to re-examine one of its artifacts, “Edo Hajimezu”—an illustration of an ancient building in Tokyo. 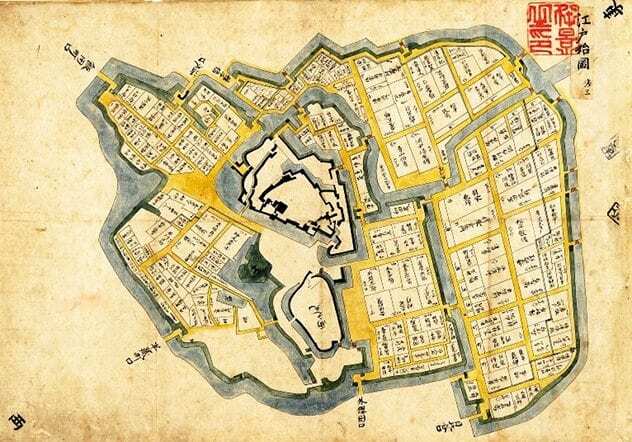 The 400-year-old map showed Edo Castle, a vast structure that belonged to the feudal family Tokugawa. Continual rebuilding obscured Edo Castle’s original design until researchers realized that the old map showed it all along. Drawn shortly after the castle was completed, between 1607 and 1609, it was a testimony to a clan that took no chances with their own safety. The design was highly defensive, more fort than home-sweet-home. Tokugawa Ieyasu (1542-1616), who built Edo, was at war with the Toyotomi family for the top dog position. The map revealed a great deal about walls, mounds, and the castle’s interior. The most fascinating defense architecture could be seen to the south of the castle. The gates and walls were planned in such a way that the enemy would have been forced to zigzag instead of advancing in a straight line. Unfortunately, this innovative feature did not survive to modern times. It is hard to imagine that finding a gate at a place called the “House of Gates” would surprise anyone, but this one did. Beit She’arim (Hebrew for “House of Gates”) is a UNESCO world heritage site located in northern Israel. When excavations in 2016 turned up a mammoth gateway, the diggers were stunned. It included half of what appeared to have been a fortified wall with doors and a tower. During the Roman and Byzantine eras, Beit She’arim was a hub of Jewish culture and law. However, the town remained small and thus far, assumed to have had no need for protective city walls. So convinced were the experts that they believed the word “gates” in its ancient name could not be literal. They even skewed it as Beit Sharay, which means “court.” Since the town was the headquarters of the Jewish judicial council, the theory fit snugly. The discovery of the imposing limestone gates forced archaeologists to rethink the town’s name and purpose. 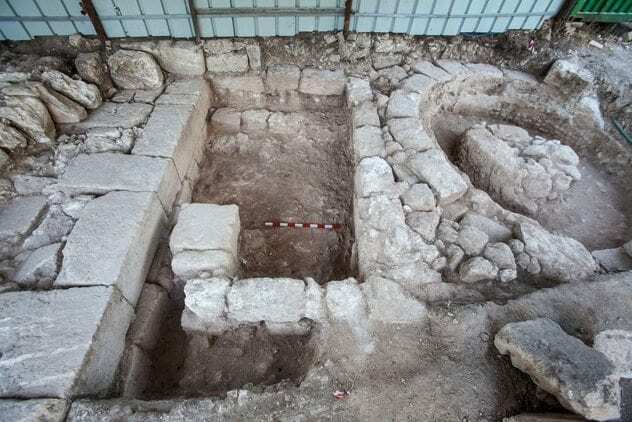 Dating to Roman times, there is even the intriguing possibility that the gatehouse is the first ruins of an unknown Roman fortress at the site. The Galloway Picts Project was started in 2012 to unravel the history behind rock carvings discovered in Trusty’s Hill Fort. When their meaning became clear, or rather what researchers believe they represent, it recovered a lost kingdom. Nobody was looking for Rheged when they first began studying the Pictish symbols on the bedrock. They were unique to the area, which made for a good archaeological riddle. Also, while its exact location was not known, the sixth-century kingdom was thought to be somewhere in Cumbria. 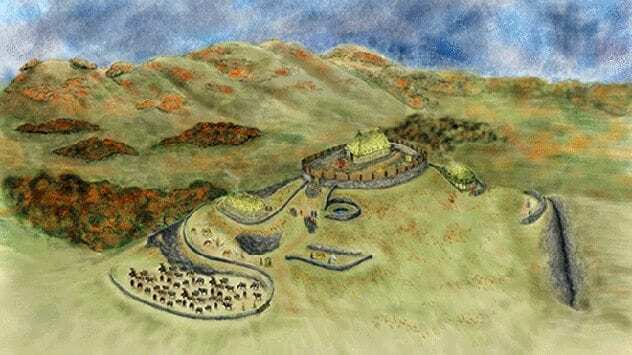 The inscriptions did not confirm that there was once a community of Picts in Galloway, but instead hinted heavily at a royal citadel from the Dark Ages (around A.D. 600). The excavations produced enough evidence to suggest that Trusty’s Hill was once at the center of Rheged. If so, the rediscovery of the kingdom is a fantastic find. Rheged was a prominent powerhouse among the northern kingdoms, and its influence was felt throughout Scotland’s literature and history. Ancient highways exist in the jungles of northern Guatemala. Covering an area of over 150 miles, it first came to the public’s attention in 1967 when British explorer Ian Graham published a map of El Mirador that included the roads. El Mirador was once the largest city-state with around a million citizens living inside its boundaries of 833 square miles. Due to being covered by thick rain forest, the causeways proved difficult to study. To bypass the secretive forest canopy, a laser project was started in 2006. 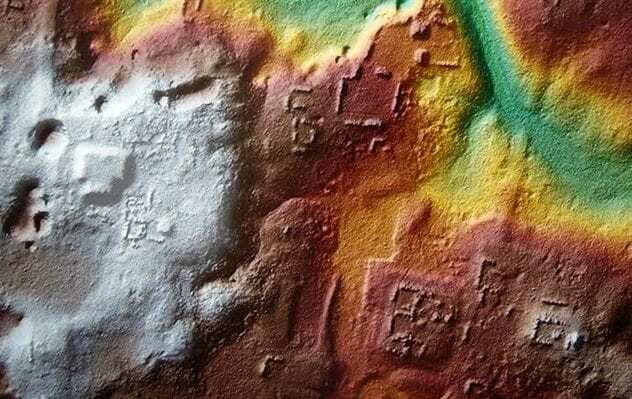 After scanning the Mirador Basin from the air, remarkable 3D images showed massive superhighways and other structures that surprised even the research team. Highly detailed pyramids, canals, terraces, and animal corrals were revealed. The most exciting discovery was the scope of the 17-road network. Snaking over the land, at some places as far as 25 miles, the causeways were up to 20 feet high and 130 feet wide. They were built at different times, between 600-400 B.C. and 300 B.C.-A.D. 100. The sophisticated road system united the large state by allowing the transport of supplies and people. The archaeological site of Qantir-Piramesse once hosted Egypt’s capital, Pi-Ramesse, under the rule of Pharaoh Ramesses the Great. Established between 1300 B.C. and 1100 B.C., no substantial ruins remain of what was likely the biggest human settlement during the Bronze Age. A German team used a novel way to find subterranean leftovers of the great city. For an incredible sixteen years (1996-2012), they magnetically mapped the area. Since ancient mud-brick buildings have a different magnetic “look” than normal earth, foundations and walls soon started to appear. They were enormous. Upon closer inspection, researchers felt they were looking at a construction site. The large-scale restoration project was perhaps set up around a palace and temple complex. Not far away was a pit with mortar at the bottom. Touchingly, the footprints of a toddler were preserved in this layer. Something else was found in the pit, and it could change the face of Egyptian art. Fragments of plaster may sound mundane, but these appeared to belong to a decorative fresco, something almost unheard of during this particular era. One of Arizona’s landmarks received a tragic overhaul of its past. 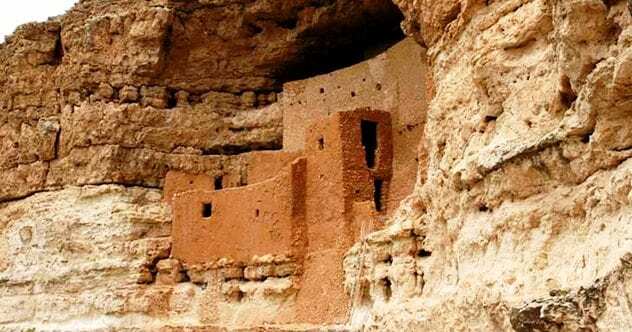 The two buildings, carved from a limestone cliff almost 900 years ago, form a part of Montezuma Castle National Monument. For more than eight decades, the disappearance of the inhabitants was one of the Southwest’s greatest mysteries. Signs that the dwellings suffered a serious fire was filed away as a “decommissioning ritual” done after the evacuation. However, Hopi traditions tell of their ancestors, the Sinagua, being attacked on site—and the story includes the use of arson as a weapon. The Tonto Apache have a similar tale but of their ancestors trying to flush the Sinagua out with fire. Modern investigations provided the archaeological evidence to these tales. The period between 1375-1395 is significant. Pottery was produced and the blaze happened, indicating that people lived there until the last moments. Four bodies found together in the 1930s were thought to predate the flames, but another look revealed their gruesome end. Three had fractured skulls. All had cut and burn marks sustained shortly before death. 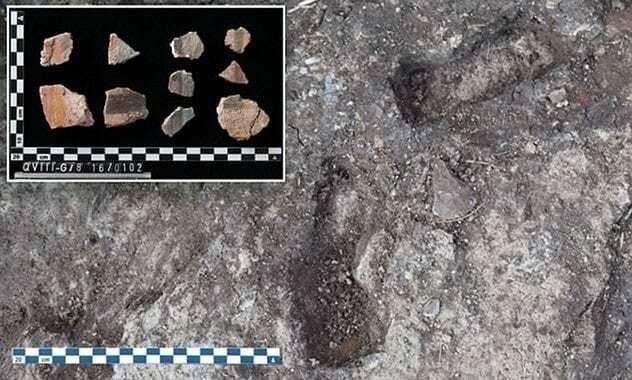 A brutal attack explains the sudden departure, but archaeologists still do not know what sparked the assault. The Garamantes was an enigmatic African people. In 2011, an expedition to Libya to find out more about the mysterious Garamantes was cut short by civil war. 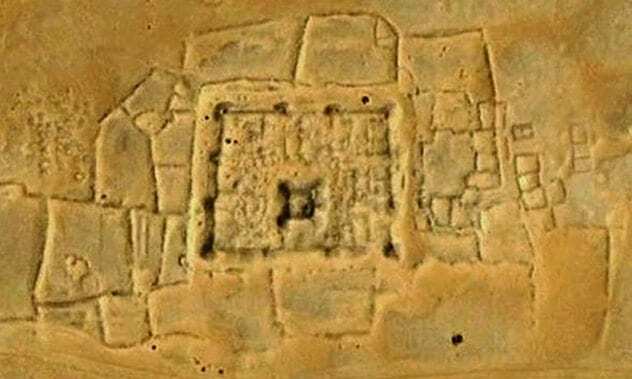 Another attempt, using satellite photography, gave researchers a good view of over 100 fortified settlements belonging to the lost civilization. Walled towns and villages stood abandoned in the Sahara 620 miles south of Tripoli. Dating A.D. 1-500, the mud-brick structures were masterfully constructed, and there are still walls standing up to 13 feet (4 meters) high. All earlier understanding of the culture came from the Garamantes’ capital, Jarma, about 125 miles to the northwest. Jarma revealed a powerful African kingdom with a writing system, metallurgy, trading, and textiles. The Sahara fortresses added another remarkable achievement. In the super-dry environment, they created oases where crops flourished. They did this with a complex subterranean canal system that brought groundwater to the surface. Why the fortresses were abandoned is unknown. Most likely, disappearing water sources and trade routes collapsing with the fall of the Roman Empire contributed.